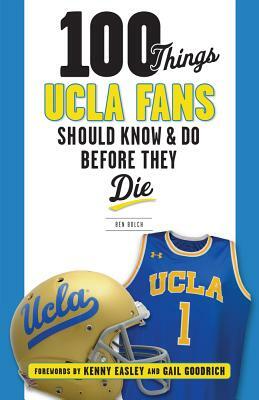 With traditions, records, and Bruins lore, this lively, detailed book explores the personalities, events, and facts every UCLA fan should know--from the hardwood to the hard courts, the gridiron, the diamond, and beyond. It contains crucial information such as important dates, behind-the-scenes tales, memorable moments, and outstanding achievements by legends like Kareem Abdul-Jabbar, Troy Aikman, Jackie Robinson, Bill Walton, Russell Westbrook, and more. Whether you were there for the glory days of John Wooden or are a more recent fan of Josh Rosen, this is the ultimate resource guide for all Bruins faithful. Ben Bolch has been a UCLA columnist for the Los Angeles Times since 1999, covering basketball, football, and other sports on campus. Kenny Easley was a five-time Pro Bowler and the 1984 NFL Defensive Player of the Year. He was a three-time All-American and his No. 5 was retired by UCLA. Gail Goodrich was a five-time NBA All-Star and two-time NCAA national champion. His No. 25 has been retired by both UCLA and the Los Angeles Lakers.